Every year my holiday sprinkle purchases became more and more reckless. In other words, I had to have all of them. My intentions were always good, wanting to create a million different cupcakes or cookies, with every kind of sprinkle on the planet. However, as the holiday madness begins….the sprinkle-palooza I dreamed about doesn’t always happen. The sprinkles began to pile up, get old and were then thrown out, only to make room for more new and different sprinkles. So, in order to stop the waste, (because I wasn’t “not” going to buy my beloved sprinkles) I started sprinkling sprinkles on sliced bananas. My kids LOVED them and as a result, I can’t keep enough bananas in the house. My boys are getting lots of banana with a little bit of treat mixed in. They love to pick the sprinkle used or I do a mix as you see here. I like to think I’m the one who thought of this, but I’m sure other Mom’s make these too. At least my kids think I am a genius (wink-wink). These are also great playdate snacks, the kids always feel like I made something special. If you have a peanut butter-banana lover in your house, these Peanut Butter Banana Towers are great on presentation and taste yummy too. This is also good with Nutella…don’t ask me how I know that. Again, kids are happy and it’s better than reaching for a bag of chips after school. This also tides them over nicely until dinner. This is one of my favorites. I take a really healthy piece of bread (7-grain, double fiber, whole wheat), toast it, schmear it with peanut butter and sprinkle it with chocolate sprinkles. This makes the healthy breads kids normally turn their noses up to, way more palatable. In fact, they don’t even notice they are eating healthy, whole grains. All are great after-school snacks, ones we serve around here continuously. It definitely helps get those fruit and whole grain servings in for the day. So this holiday season, don’t feel bad about over-buying the sprinkles…you’ll put them to good use. Wish my kids were still at that “sprinkles” age! Although, maybe you never grow too old for them. I love the idea of a peanut butter and sprinkle sandwich! I have every kind of sprinkle here, too! (Except it seems the particular ones I’m looking for at certain times, so I then need to get more!) I cannot have enough. Sprinkles and cupcake liners! I don’t think I’m as bad as Bakerella, but probably close. When we moved I packed a whole big box that was just sprinkles and liners! 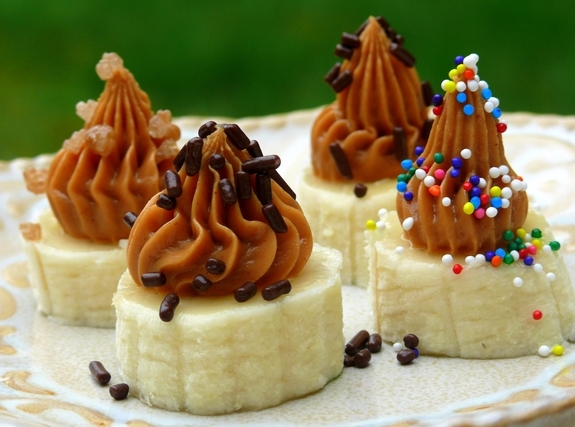 LOVE the sliced bananas WITH peanut butter idea! I’ll give the credit to you–since it’s the first time I’ve seen that as a way to use those sprinkles. Brilliant, Cathy! What great ideas!!!!! Going to go slice up some bananas for Gaby right now…sand the peanut butter because she can’t stand the stuff, but toss some greek yogurt on top and let her have a field day with the sprinkles. Wow! I LOVE this idea….. I am definitely going to make these for my own kids!!! What the world woman? You are such a life-made-easier guru! Thank. You. Oh, so doing this for after school…thanks! 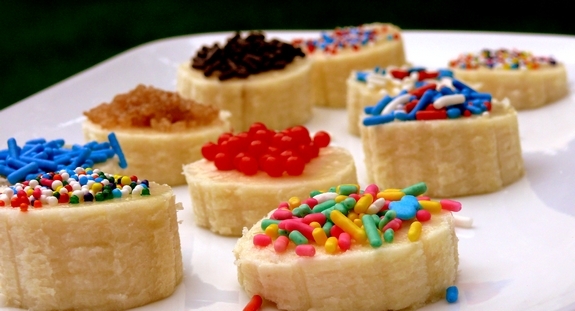 Genius – using them on a banana, so simple but yet so something kids would devour!! 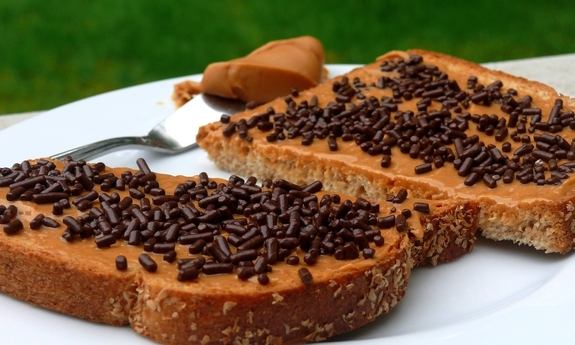 The sprinkles on bread is a typical Nederlands breakfast. They love a sprinkling of sweets on many things – called hagelslag. Grown-ups never out grow it, and grocers have a shelf dedicated to sprinkles/toppings. Not just you Cathy, I have the same problem. Thanks for the idea, I also like the pb and chocolate sprinkle for breakfast. MOD converted output video quality in the video aspect of 4:3 and 16:9. Now why did I not think of that!!! My children are forever asking me for something sweet. At east with these snacks they I will not feel too bad for giving in!! Also try sprinkles in plain yogurt or cottage cheese. It makes them change colors, especially if you use the colored sugar kinds. Great idea! My kids will be thrilled to help make these and then gobble them. What a great idea. So pretty too. I love sprinkles. I wonder if I could put sprinkles on pie? I don’t buy the sprinkles; my girls just bring them home in massive quantities! These are great ideas! The one on bread reminds me of faery wings. Butter bread, sprinkle with sprinkles, and slice in triangles. This is all very clever, will have to try on my overgrown assortment of sprinkles. We don’t have leftovers because our younger son puts them on his ice cream!